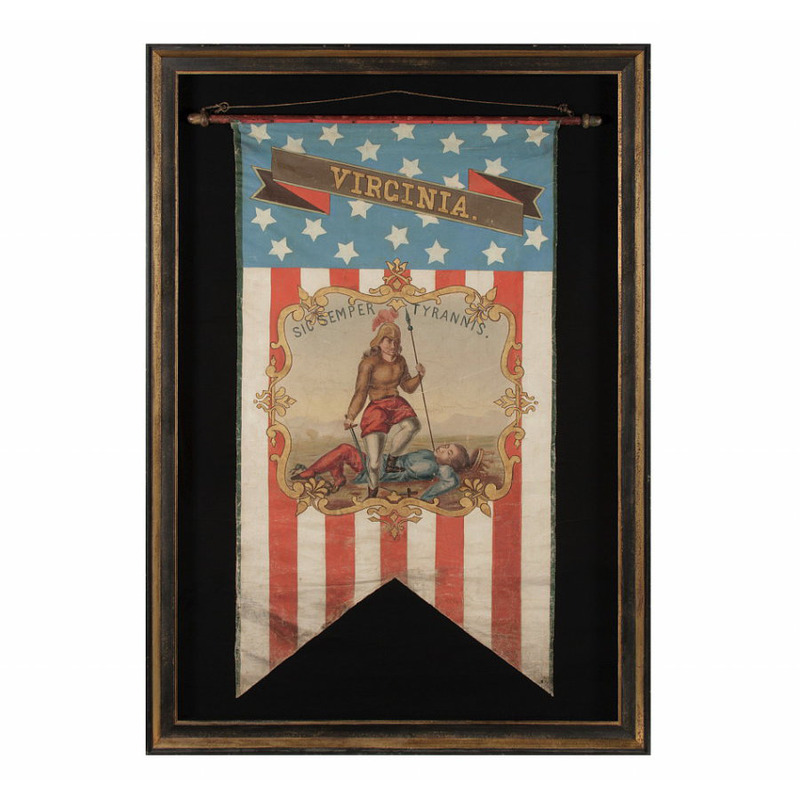 Frame Size (H x L): 75.75" x 52"
Flag Size (H x L): 65" x 34"
Swallowtail format, patriotic vertical banner bearing the name and the seal of the State of Virginia. Made in the period between 1861 and the 1876 centennial of American independence, the textile is entirely hand-painted on heavy cotton or linen. This is the only stars & stripes format, 19th century banner with this heraldic image that I have ever encountered in private hands. Note the bold and interesting imagery, which includes a modernistic, folded streamer on a cornflower blue field of 21 visible stars and a interpretation of the device of the state, executed in a folk style. 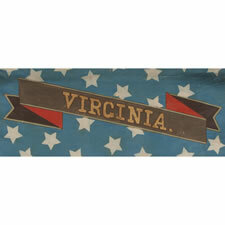 In May 1776 the Virginia colony declared its independence from Great Britain. On July 1, 1776, a committee of four was appointed to make a proper seal for the Commonwealth of Virginia. The four men were Richard Henry Lee, George Mason, George Wythe, and Robert Carter Nicholas. Four days later the committee's report for a design of the seal was read, and George Mason presented it to the Virginia government. It was voted on and approved that same day. It is not known for certain which members of the committee were chiefly responsible for the design of the seal, but it is generally believed to be principally the work of George Wythe. The seal makers did not want a design which in any way resembled the style of coats-of-arms used in Britain. Due to strong admiration for the Roman Republic among Virginia leaders, the design of the new seal was taken from the mythology of Ancient Rome. 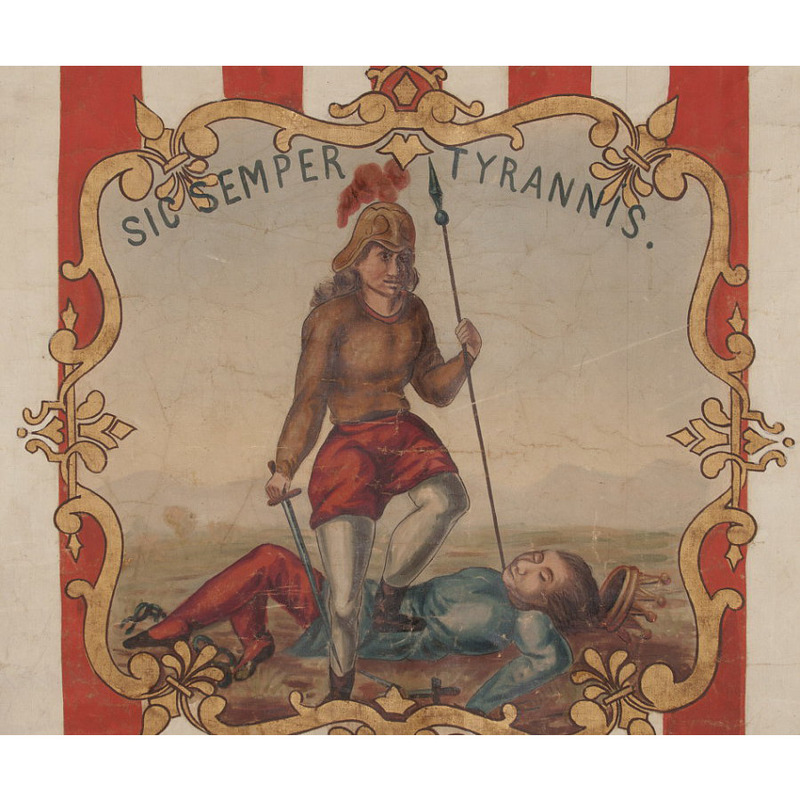 The Latin motto "Sic semper tyrannis" translates in English as "Thus always to tyrants". The imagery shows tyranny lying prostrate beneath the foot of Virtus, the Roman deity of virtue. The royal crown has fallen to the ground to symbolize the new republic's release from the monarchical control of Great Britain. It is interesting to note that Virginia and New York are the only U.S. states with a flag or seal displaying a crown. The robes of the fallen monarch are typically purple, as reference to Julius Caesar and the Etruscan king of Rome, Tarquinius Priscus, but the many artists who copied state seals took great liberty in their work and thus great variation is seen from one example to the next, especially in the 18th and 19th centuries. 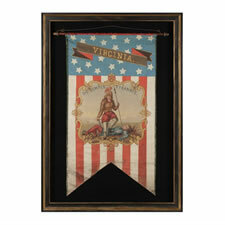 Banners of this type were often hoisted on single vertical staffs that held the rope aloft in the center. This basic style was both carried in parades and affixed on mounts indoors. Similar decorations and banners can be seen along the walls at early political conventions, or hoisted among benches, where they denoted the positions of the seating of attendees from various states. 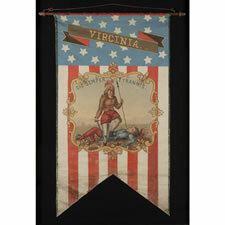 This particular example was found among a series of banners representing Mississippi, Oregon, Pennsylvania, Delaware, Illinois, Louisiana, and New York City. One representing Kansas is also known. The presence of the New York City example suggests that whatever event they were used at occurred in New York. The 1868 Democrat National Convention was held in Manhattan at Tammany Hall. A colorful illustration, printed for Joseph Shannon's Manual of the Corporation of the City of New York, shows the interior of the building masterfully festooned with patriotic banners, medallions, and buntings of similar nature, but none that match this particular style. Only the front and central interior are pictured, but two full sets of state identifying decorations are shown. This banner and its mates could well have hung elsewhere on the premises. No Republican National Conventions were held in New York during the 19th century. 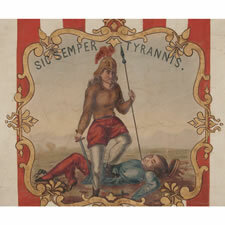 An alternative possibility is that the banners were used in festivities pertaining to the centennial of American independence in 1876, either in New York or at an event such as the Centennial International Exhibition in Philadelphia, a six-month long World's Fair event, where a city like New York probably had its own pavilion, along with each individual state. 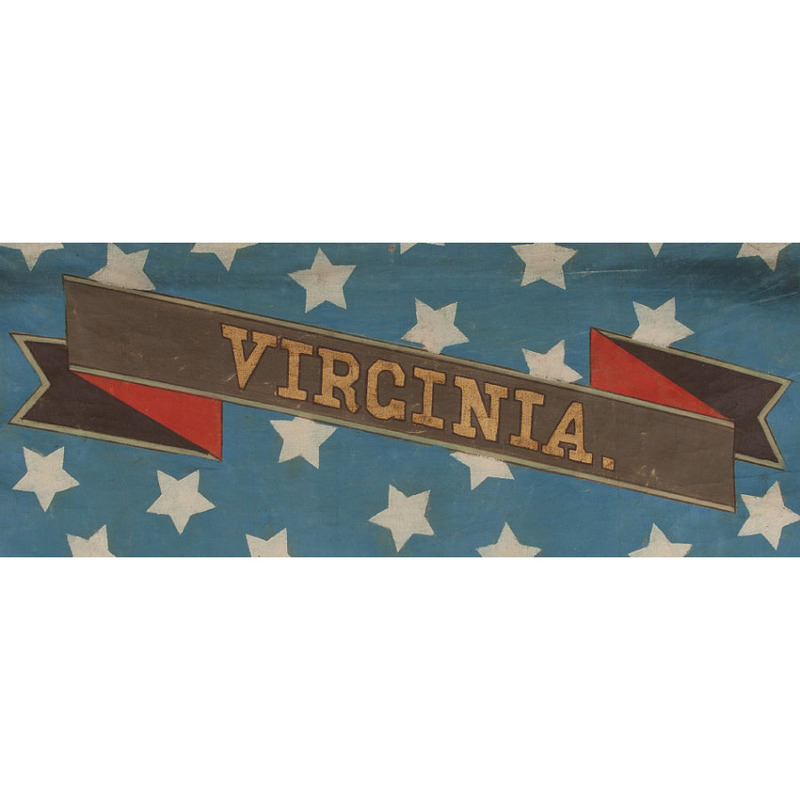 Whatever the case may be, the textile is a boldly graphic, colorful survivor and presently represents the only privately held banner of its kind that I am aware of with the device of Virginia. Construction: Painted cotton or linen tacked to a wooden staff with acorn finials that is original to the banner. A length of red wool tape was used to reinforce the point where the tacks are affixed. Mounting: The banner has been hand-stitched to a background 100% cotton, black in color, which was washed to reduce excess dye. An acid-free agent was added to the wash to further set the dye, which was heat-treated for the same purpose. The mount was then placed in a black-painted, hand-gilded and distressed Italian molding. A shadowbox was created to accommodate the staff. The glazing is U.V. protective acrylic. Condition: There is minor soiling and there was very minor paint loss. 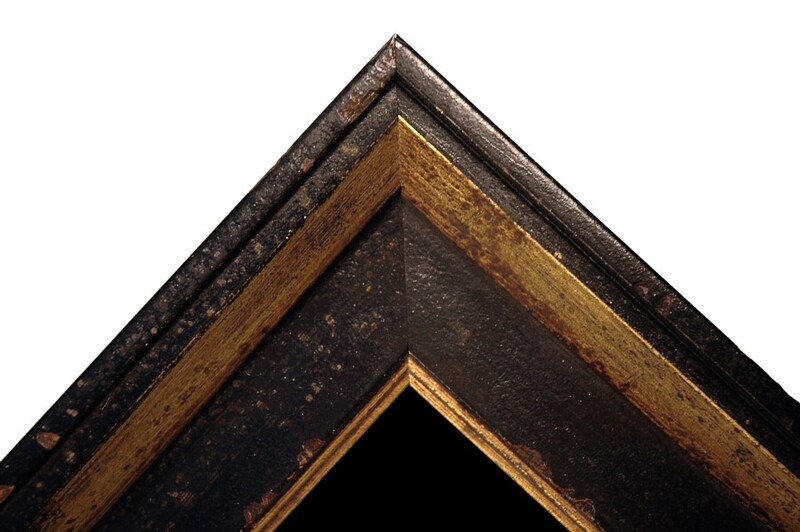 A very minor amount of professional restoration was undertaken. There is some breakdown around the left eye of the soldier. Many of my clients prefer early flags to show their age and history of use.